A life with strong and healthy personal and professional relationship is a life worth living. Enter Forever Hold Your Peace, a collection of soul-awakening quotes written by Linda Salazar. No new “program” or “system” to learn, just nuggetized wisdom you can put to work right now to dramatically elevate the quality and strength of your most important human connections. Quotes can be wonderful tools–and touchstones–on your path to spiritual growth and inner peace. Use Forever Hold Your Peace to make that journey richer, more satisfying and more fully “connected”! This book is a beautiful gift. 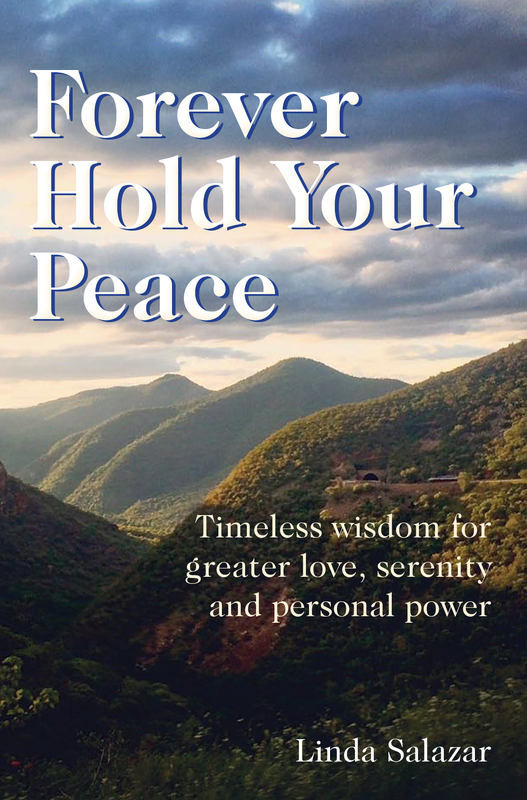 Forever Hold Your Peace is a small book with a big mission: peace is a choice in every moment. In a world that often feels less than peaceful, Linda allows us the sovereignty to choose her helpful words and find more peace – you can drink in her book all at once, or take sips when you want or need to. I keep a copy of Forever Hold Your Peace in my purse so if the day pushes me, I can ground back into peace with a quote or two from Linda’s book. I also keep a copy on my nightstand so I can bookend my day, morning and night, with peaceful perspectives. Life can often seem disconnected from calm, kindness and compassion. 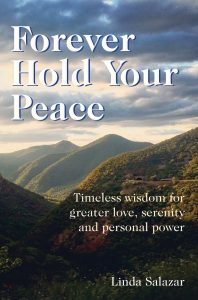 Forever Hold Your Peace is a potent remedy to return us to truth: inner peace is possible no matter what life brings our way. I am filled with gratitude that Linda has shared her insights and wisdom in this beautiful book, so that everyone can cultivate more inner peace. Forever Hold Your Peace is a book that offers a miracle on every page. Turn to any page in the book and you’ll receive ancient wisdom packaged into a crisp and clear message sure to deliver a ‘reset’ for peace during precarious times. Linda has clearly poured her heart and soul into creating deeply stirring quotes to uplift and inspire the reader into a more meaningful life with a fresh perspective. I’ve purchased several copies to give away as gifts and each recipient responds with overwhelming gratitude. I LOVE LOVE this book! The messages Linda Salazar has written are clear and straight to the point. Everyone can understand these! So to the point that you will pause each time you read a quote, and look within for where you need to place these wise words. The work is always within… Linda’s book is a wonderful and timeless addition for this work. My favorite thing to do is, open up the book to a random page, and walk with that particular quote for the day. In our world today where peace has become a bit of a rare commodity…Linda’s quotes bring comfort and wisdom… and calm the soul. Sometimes I’m amazed that when I randomly open to a page…I read the exact words that I need to hear in that moment! They instantly shift my reality to a more peaceful and centered place. The book is filled with gentle reminders and powerful insights that address the human condition in such a loving way. Give yourself the gift of these original and wise little gems…they will inspire you and guide you to your most loving and compassionate self. Linda Salazar has truly mastered the art of delivering complex and insightful thoughts, feelings, and advice in simple, yet profound lines. The reflective words on each page gives me the inner guidance I need when I need it, feeling like a better version of myself that is better equipped to tackle life with more ease and grace. The elegant simplicity of the delivery of her life messages makes the powerful words on paper become powerful thoughts in your mind. I love this book! Each time I open it I’m brought to the perfect quote that helps me stay centered and grounded for the day. Linda has so beautifully shared her words of wisdom in a way that hits right to the core of my soul. It’s full of life nuggets that brings clarity, awareness and greater patience as I move about the world on a daily basis. As a teacher, I am often asking my students to think about their growth mindset. The inspirations and thoughts Linda has compiled in Forever Hold Your Peace have deeply supported my own self-reflection and inspires me each day in my own personal growth.